One of the things I think is absolutely critical in my homeschool is to teach my kids how to think. I want them to be able to take a look at all the “stuff” of life and actually be able to analyze what they are being told and decide if it makes any sense at all. In a year like this, with a presidential election going on, there is a perfect opportunity to work with informal logic and specifically with logical fallacies. This is a great skill for wading through political rhetoric, but it is also important when listening to advertising, or when discussing theological issues. I have two teens in high school, and they were not enthusiastic about studying fallacies. When I told them I was reviewing The Fallacy Detective by Nathaniel Bluedorn and Hans Bluedorn, they sighed and knew they were stuck. One way you could easily incorporate this into your schedule is to simply do a chapter a week for an entire year. Two chapters a week would take you a semester. We opted to try for four chapters a week, and finish it over the course of a couple of months. The book is easy reading for a high school student, so you could easily hand this to your student and tell them to go for it. That isn’t the approach I’d recommend though. I opted to read each (short) chapter out loud to my two teens, with lots of breaks to discuss the often silly examples. They’d take a look at the comic strips, which include all kinds of recognizable characters such as Calvin and Hobbes, Dilbert, and Peanuts. And then we’d do the exercises together. And debate the answers. And argue back at the authors when we disagreed. Those are the moments when I truly realize how much I love homeschooling my big guys. We did not maintain our four chapter a week pace, but we are down to the final four chapters of the book. We seem to have a very hard time picking it up at this point, mostly because we don’t want this to end. What has been truly exciting though is to be taking a look at all the people trying to sell us something and to have the words to explain what is wrong with their arguments. For example, one of the amendments on our local ballot earlier this month had to do with allowing the county government to sell internet services, or something like that. We were reading some of the materials put out about why to vote for this measure, and one of the first reasons given was that many other counties do it, so we should too. 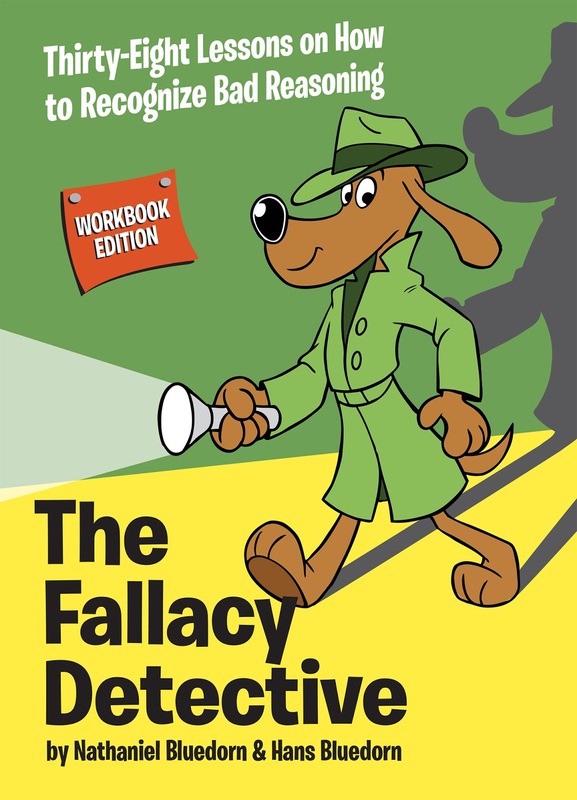 Prior to Fallacy Detective, we would have laughed about whether or not you would jump off a cliff if your friends were doing it. So we recognized there was something wrong with the logic being used to convince us to vote yes. After this book, though, we were discussing whether this is an appeal to the people or not. 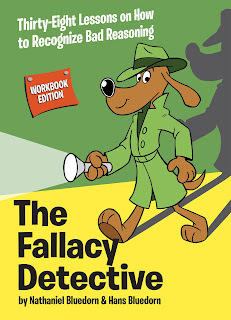 I grabbed Fallacy Detective, and we jumped ahead to the Bandwagon chapter in the Propaganda section. Basically, the idea in both is that we should do this because everyone else is doing it. I highly, highly recommend this book. My middle school kids kept “happening” to be present when we were working in this book, and I definitely think this can work with middle or high school ages. I plan to go through it with the two younger ones in another year or so. Trivium Pursuit has some other fantastic products you ought to check out as well. Teaching the Trivium is one of my favorites. Disclaimer: I received this book for free from the publisher. No other compensation was received. The fact that I received a complimentary product does not guarantee a favorable review. I have this one, but I think my current crop of homeschoolers is a little too young for it. I'd love to hear if you know of any similar products for the elementary aged kids. Sounds like a good one! I think my oldest is not quite ready for this kind of thinking yet, but I'm going to have to put this on my list for consideration in a year or two. I am *so* looking forward to doing this kind of work with my kids!